Now we will proceed next tourist destination that struggle Bajra Sandhi Monument, where the monument is located in front of the Office of the Governor of the Province of Bali, exactly in Renon area. Around of this place,there is a very broad field as well as the staging of art. And is usually used by people to exercise as well as certain activities such as competitions, performing arts and others. This monument has a building area of 4900 square meters and a land area of 138 830 square meters. In this monument there are 17 stairs in front of the main door, 8 poles in the building grand monuments and monuments that rises 45 meters. The monument is known by the name of "Bajra Sandhi" because its shape resembles a bell bajra or used by Hindu Priest in utter Veda (mantra) during religious ceremonies. As the name suggests, there is a monument that the museum holds memories about the persistence of fighters Bali since the days of empire in Bali to seize and defend the independence of Indonesia, especially in Bali. Facilities owned by Bajra Sandhi Monument is very adequate as a large parking area and a neat, clean public rest rooms, a place to buy souvenirs, drink and eat in the parking area in front of the field Renon. On the outside of Bajra Sandhi monument, we can enjoy Bale Bengong four corners of the museum for the rest of the tourists. Museum building towering mountain symbolizes the Mandara Giri. Guci Amertha symbolized in the form of Kumba (pot) right upper part of the museum. Naga wrapped around the museum symbolizes the Naga Basuki used as a rope in playback Mandara Giri. Tortoise found on the bottom of the museum is a symbol of Bedawang Akupa used as a screening board Mandara Giri. Pool located around the museum are symbols of the Milk Ocean that surrounds the home to the Mandara Giri Holy Water of Life or Tirtha Amertha. Both creatures are Naga Basuki and Bedawang Akupa is closely associated with the struggle for Tirtha Amerta mythology among the Gods with the Asura (demon). Top Utamaning Mandala is the 3rd floor, the top position serves as a space of tranquility, a place of silence-silence enjoy the atmosphere of the distance around the monument. Top Madyaning Mandala is the 2nd floor which serves as a diorama which amounted to 33 units. On the second floor is used as a miniature display of Balinese struggle from time to time. Top Nistaning Mandala is the ground floor of the building Bajra Sandhi Monument. On the ground floor there is an information space, library, exhibition hall, meeting room (meeting), administrative space, buildings, and restrooms. In the middle of the room there is a lake named as Puser Tasik, eight pole grand, well-shaped staircase rose periwinkle. If we enter a room diorama, then we will know the historical events that are useful Balinese struggle for knowledge generation. Diorama totaling 33 pieces depict the life of the Balinese people since prehistoric times until the time of maintaining independence, between the years 1950-1975. Monday - Friday: 8:00 to 5:00 p.m.
Ok Bro And Sis If traveling to Bali do not forget to visit the Bajra Sandhi Monument, guarantee your memories will not be forgotten here, because you have not seen in person and closer to the content in these monuments. So not to be missed. 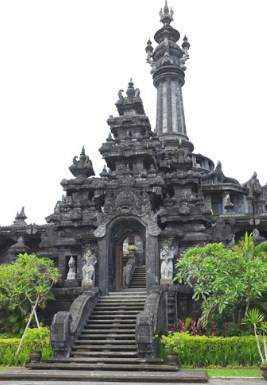 0 Response to "Denpasar Tourist Destination, Monument Bajra Sandhi Renon"